To what degree does a one-yen change in the foreign exchange rate affect sales and profit? With regard to foreign exchange sensitivity, it is estimated that a one-yen fluctuation against the dollar would have an impact amounting to ¥6.0 billion on sales and ¥500 million on operating profit, and against the Euro, an impact of ¥4.0 billion on sales and ¥1.6 billion on operating profit. However, because Ricoh does business in various regions and settlements made in Asian currencies have also increased, we can no longer express the foreign exchange impact solely in terms of the dollar and the Euro. Is there any business risk if the U.K. leaves the EU? While we believe that there will be no major immediate impact should the U.K. leave the EU, there would likely be an impact if the European economy overall were to decline as a result of the U.K.'s exit. Our European headquarters are located in the U.K., along with manufacturing sites and other facilities, which are points of close contact with customers, so if there were such a change in the situation, we would respond swiftly taking into account customer needs. Ricoh's ROE is 4%. Isn't this too low? Do you have any plans to raise ROE by buying-back shares? And how about making growth investments in the OELD (Organic Electroluminescence Display) products? We are not satisfied with the current level of ROE, and we want to further increase operating profit and raise ROE. We will give consideration to purchasing the Company's own shares in an appropriate and timely manner, while taking into account the status of cash generation and investment. Regarding OELD, we appreciate your suggestion and take your comments as valuable feedback from a shareholder. Please tell us about Ricoh's patent ranking, patent income, and payment amounts. The total number of patents held by Ricoh in the fiscal year ended March 31, 2016 was 48,312, including both Japan and overseas. Of these, 25,491 were in Japan, and 22,821 were overseas. The number of patents registered during the previous fiscal year was 2,049 in Japan, ranking 7th domestically for patent registrations, and 1,627 in the U.S., ranking 15th. We believe Ricoh is highly regarded for both the quality and quantity of its patents. As for patent income, that information is not disclosed, so we would like to refrain from mentioning this amount. I believe there are many manufacturers of multifunctional printers in Japan. Don't you think a merger or business integration with another company is inevitable in the future? Speaking in general terms, that is something we might consider if it were necessary for the continuation of the business. 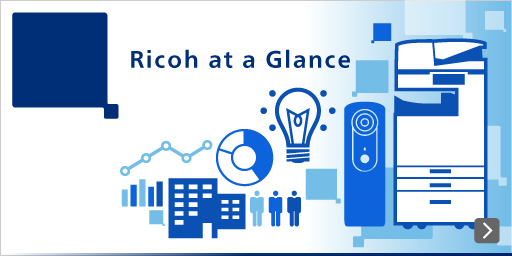 Copiers are what most people associate with the Ricoh name, but what do you see as the next growth area? We are aiming at growth in businesses adjacent to our core businesses, for example, in the areas of production printing, and industrial printing using our inkjet system. We are also targeting fields such as factory automation (FA), on-board automotive optical equipment, additive manufacturing (3D-printer-related businesses), and healthcare. However, we won't do just anything, but will strive to cultivate businesses in areas that use our core optical and image processing technologies. One of the issues to be addressed by Ricoh was companywide structural reform. I'd like to hear specifics about this. How much impact do you expect from this reform on profits for the fiscal year ending March 2016? Structural reform is not simply a matter of cutting costs, but is carried out through the accumulation of steady actions such as optimizing the sales structure and production bases. We reduce overall costs and invest the savings in new businesses. Furthermore, structural reform is implemented in all fields, through measures such as selling unused assets and creating a production system that is less susceptible to the exchange rate. The specific amount from the effects of the companywide structural reform has not been disclosed; however, the forecast for this fiscal year has incorporated such effects. What is being done about information security when handling of huge amounts of data, and how is such data being utilized? We are taking appropriate measures as a company in response to information security. As for utilization of big data, etc., it is starting to be reflected in our businesses. We are carefully addressing cyber security. I'm a Pentax fan. The entire camera industry is stagnating, so what are your thoughts on future business development at Ricoh? It would be difficult to achieve major growth with traditional cameras alone. We are striving to develop products that offer new visual experiences, such as the RICOH THETA. We are also working on new businesses using optical technology. I hope you will consider developing printer products that can be used together with cameras, such as color printers for photographs and compact printers. We appreciate and take your comments as valuable feedback from a shareholder. With regard to sales by region, revenues are increasing at a higher rate in the U.S. than in emerging countries. In which of these areas will you invest management resources in the future? One of the reasons for the high rate of revenue growth in the U.S. is the exchange rate. Another is that emerging countries such as those in Latin America are included in this region and contribute to its growth. We are still focusing efforts on the Asian region, including India and China, with a view to the future. Naturally, we want to put efforts into emerging countries. I'd like to make a comment with regard to creating a resilient management structure. I've personally had experience in doing business with the Ricoh Group. Ricoh spent three days with us onsite carrying out the final acceptance inspection of the product. It was the first time I'd experienced anything like that. I believe that it is the accumulation of such practices that makes for a resilient management structure. We would like to express our gratitude for your acknowledgement of our efforts. We will create a resilient management structure, while always thinking about how to grow together with our partners and our customers. With regard to the status of employees, what is the average salary? Is it more than it was five years ago, or not? Employee composition has changed, so we are unable to make any meaningful general statement. Recently, there has been a series of customer information leaks. What kind of measures is Ricoh taking with regard to information management and cyber security? We have been implementing thorough ongoing measures including screening of suspicious mail, comprehensive education for employees, and 24-hour monitoring of our network. We have also acquired the international standard for ISMS (Information Security Management Systems), but we will not let this make us complacent about continuing our efforts. Although the amount of capital expenditure is rising, research and development expenditurehas stayed about the same. I hope you will strengthen the company's technological capabilities in order to make Ricoh's technology the basis of its global appeal. R&D investment is always in the range of 5-6% of sales. We are investing in new businesses, and these are starting to show results. Currently, 80% of our R&D expendituresis investment in our core business, but we are increasing the percentage of investment aimed at cultivation of new businesses such as industrial printing, healthcare, and social solutions. Ricoh owns a rugby team, and I'd like to hear your thoughts on corporate sports going forward. Many of Ricoh's rugby players are not professionals but employees who practice in the evenings. We will continue to respect employees who want to do both rugby and their job. We believe that is the starting point of corporate sports. 1)	Have you introduced a system of equal pay for equal work? If so, how would you conduct self-evaluation? 2)	I am concerned that the ratio of female corporate officers is low. 3)	Do you have any products that were developed specifically from the viewpoint of women? With regard to wages, if the work and the conditions are the same, the pay is the same. However there are rarely cases where everything remains identical and where all the conditions remain the same. Promotion of diversity is important, and we want to actively promote talented personnel, including those in managerial and executive positions. For example, in areas such as social solutions, we would like to incorporate a variety of perspectives as we develop the business.